This project was sponsored by Rockler. All opinions are my own. You know, the one that I was ready to put a hammer to and (as one reader suggested) make firewood out of it. HA! I had found it for about $7.00 one day at the thrift store, and for that price, I had to have it! But it sat in my garage for so long, collecting dust, until recently I decided I was going to tackle it in hopes of working through a lot of the projects that I been hoarding in my garage. 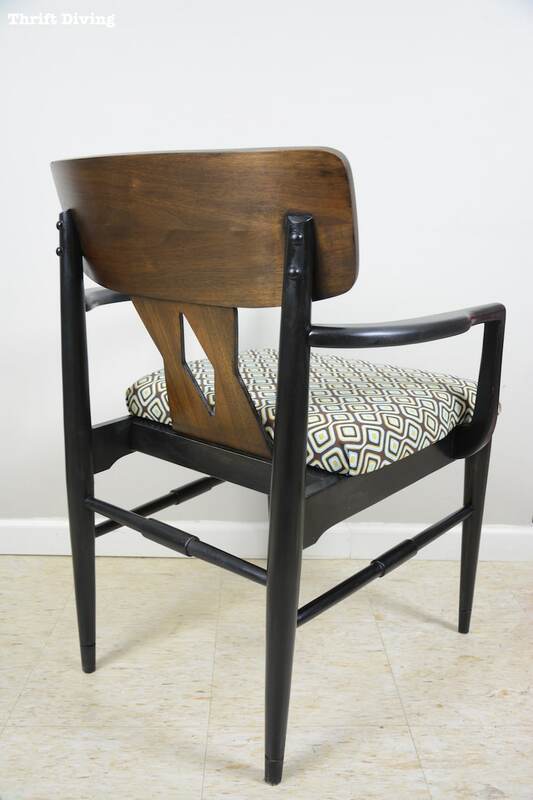 If you recall from Part 1 of this mid-century modern chair makeover, I had stripped the chair, most recently using Blue Bear Paint & Urethane Stripper from Rockler, which is a soy-based stripper (it has virtually no odor–LOVE LOVE LOVE). 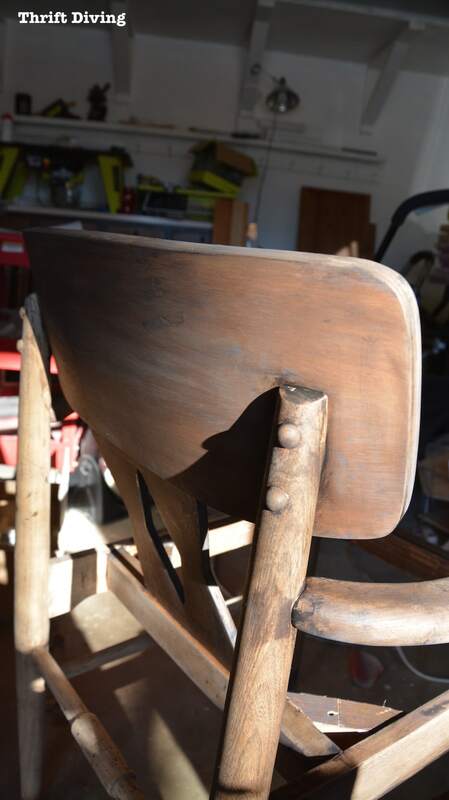 While stripping the chair, I learned that the wood on the back of the chair was not the same wood as the body of the chair. You awesome readers informed me that this was often done by cheap manufacturers to save money. I had decided to keep going because you never know–even with different tones, maybe it would look awesome after it was stained! (ahem, cought). I had to get that stripper off, so I used a bucket of water and a scrub brush to clean it. I sanded it down as best as I could, thinking that I had done the World’s Most Amazing Sand Job on this chair (HA! Little did I know…). And that grain….it was soooooo beautiful! 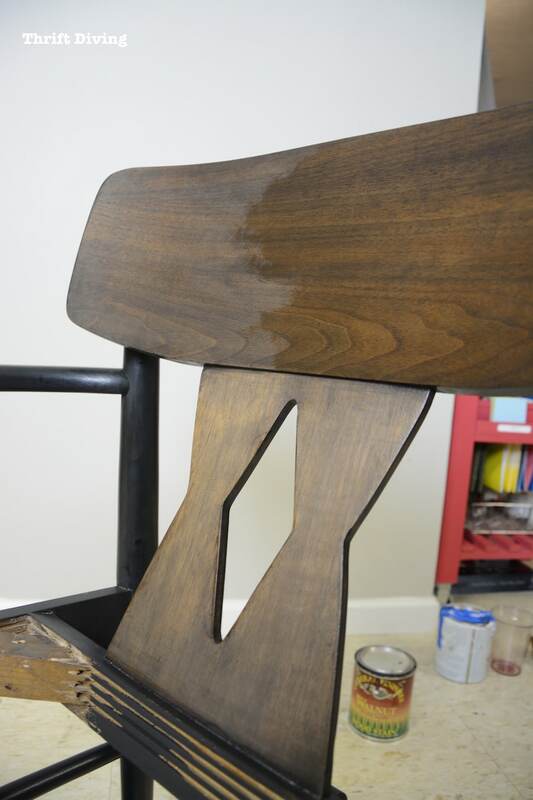 I applied the General Finishes water-based walnut stain. 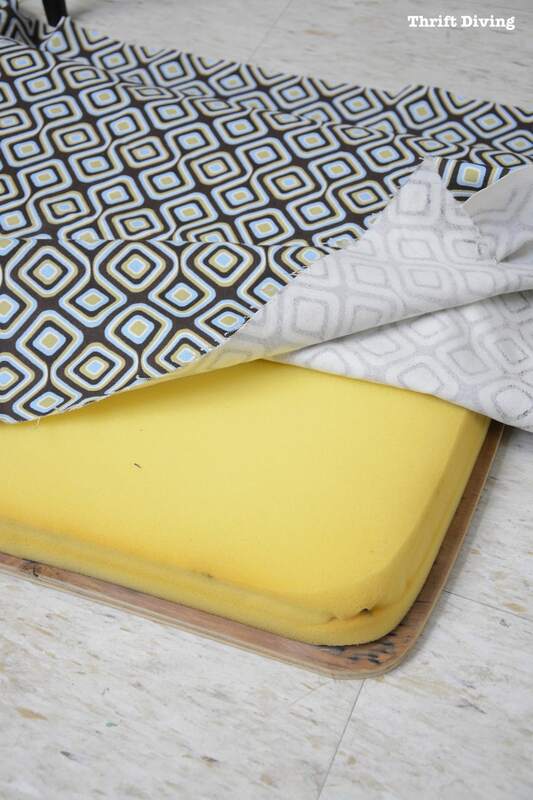 It’s much more natural than oil-based stain and you can’t smell it! If you’ve used oil-based stains, you know you’ve got to use that stuff outdoors and it’s pretty toxic. I wanted to try it out to see how it would perform (and smell!) compared to the oil-based that I was familiar with. The directions said you have to slather on a lot so that it’s easy to wipe off and get an even finish, so I painted it on and tried to wipe it off in even strokes. 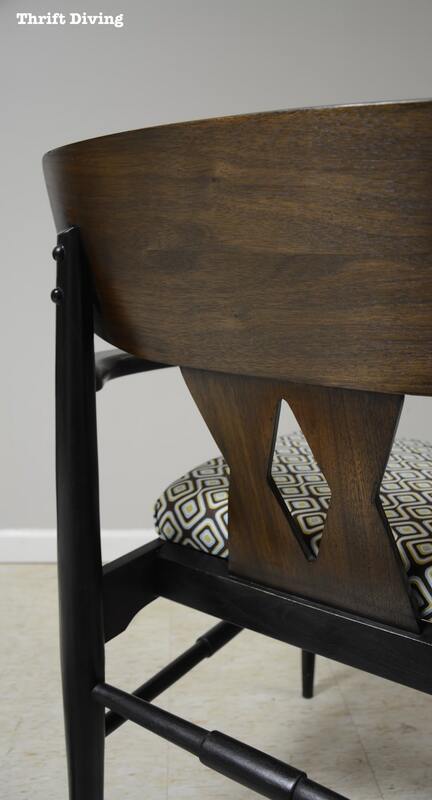 But as I wrote in PART 1 of this mid-century modern chair makeover, it turned out an awful, blotchy mess because of the crap sand-job I must have done. 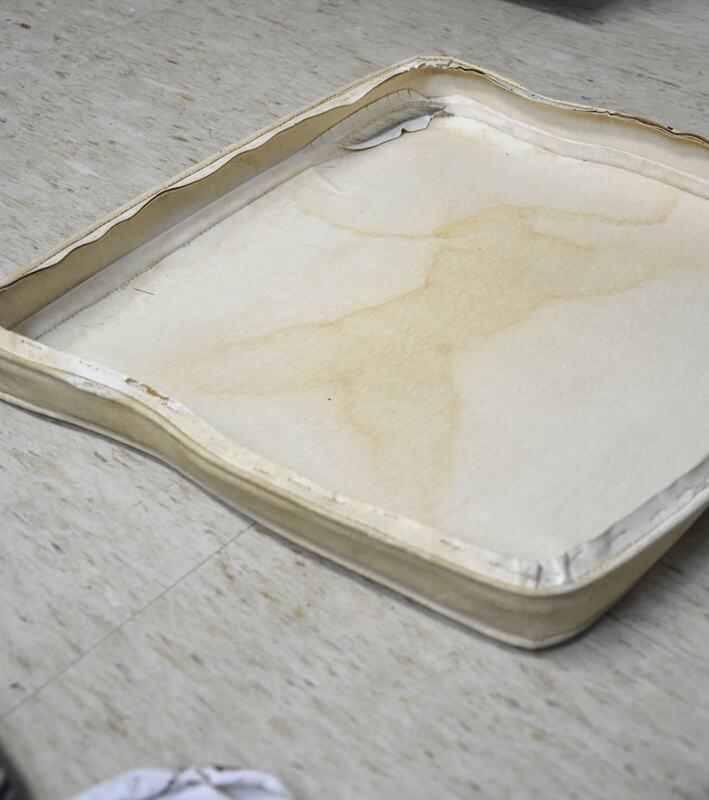 Plus, since this stain is more “gel-like” it requires a bit more carefulness. 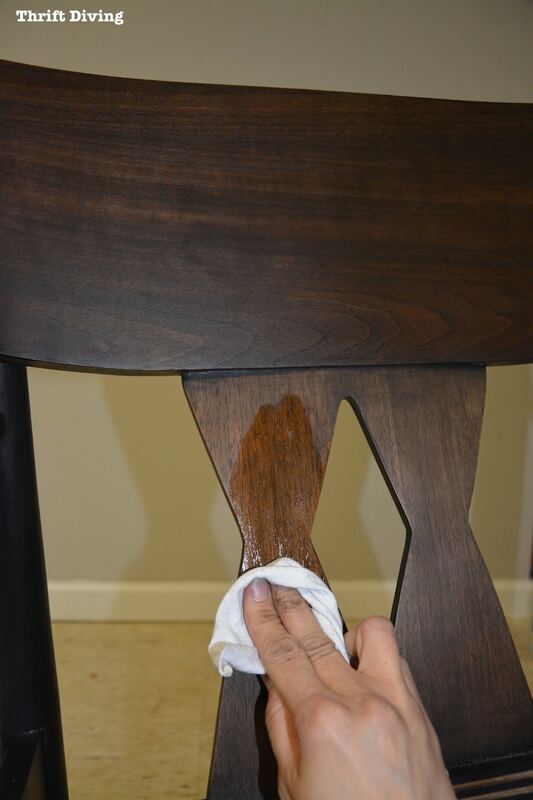 One wrong move of your cloth while wiping and you can easily brush stain again parts that are already stained. And that’s what happened to me. 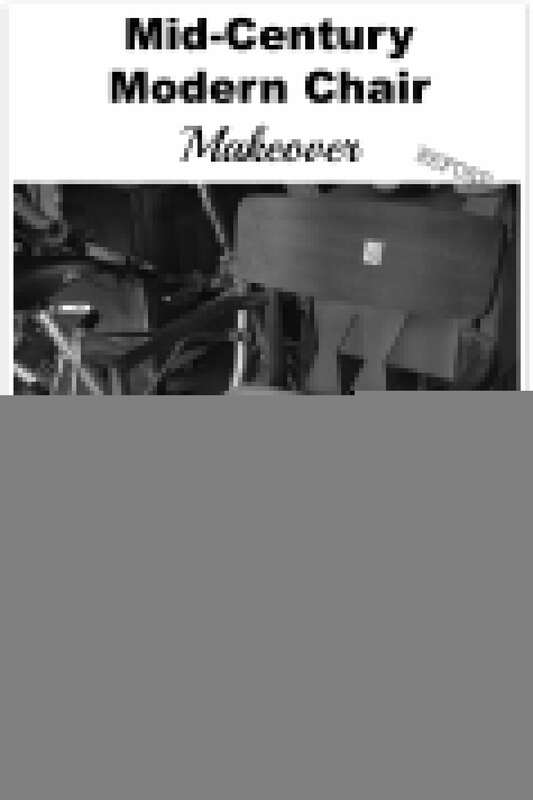 The chair was a hot mess, all because of me. As disappointed as I was, I had hoped I could salvage the chair. I just needed to think about how I wanted to proceed. This is how the chair looked when I walked away from it at the end of that day. Yikes. My first thought was to paint the body black while keeping the wood grain that I had stripped and re-stained. So the body got a coat of black paint (I used Amy Howard–worked so well! ), and I left the back wood-toned. Don’t you hate when that happens?? You get stuck and then have no desire to finish a project because you’re no longer inspired. But I wasn’t going to let that happen. I don’t just give up on projects. I use them as teachable moments and to train myself to think of solutions! I decided to just keep going. 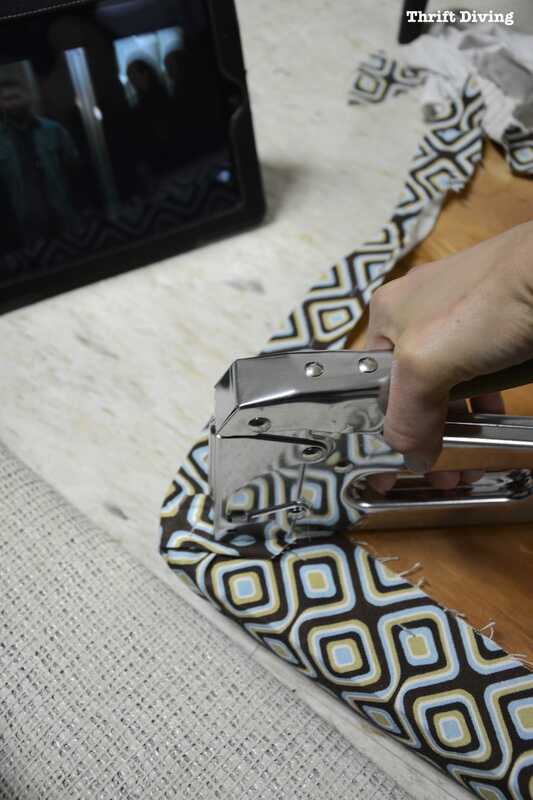 It’s hard to say you don’t like a project when you haven’t even finished! 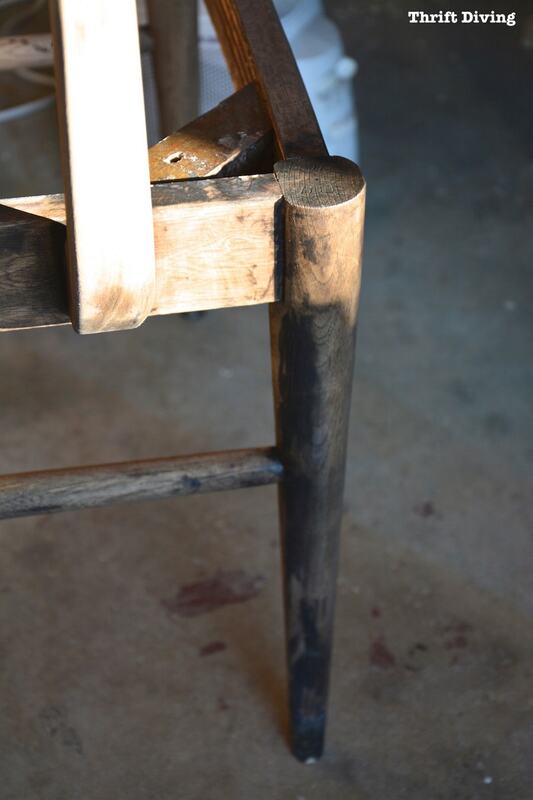 Someone in the comments section on Part 1 of this project reminded me about using steel wool, which is flexible and can work well on wood (especially rounded parts, like legs). 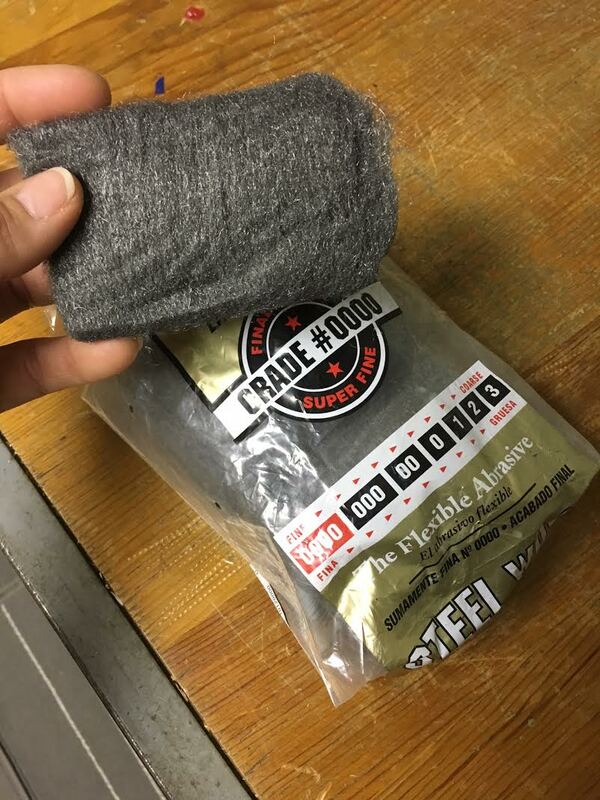 I actually have a ton of the stuff lying around and decided to use this really fine steel wool to smooth out the wood parts of the chair, which worked really well! After a few passes with the steel wool, I wiped on some Rockler tung oil. You can see how smooth the wood is after the steel wool, and adding that tung oil was like magic! The wood seemed to come alive! 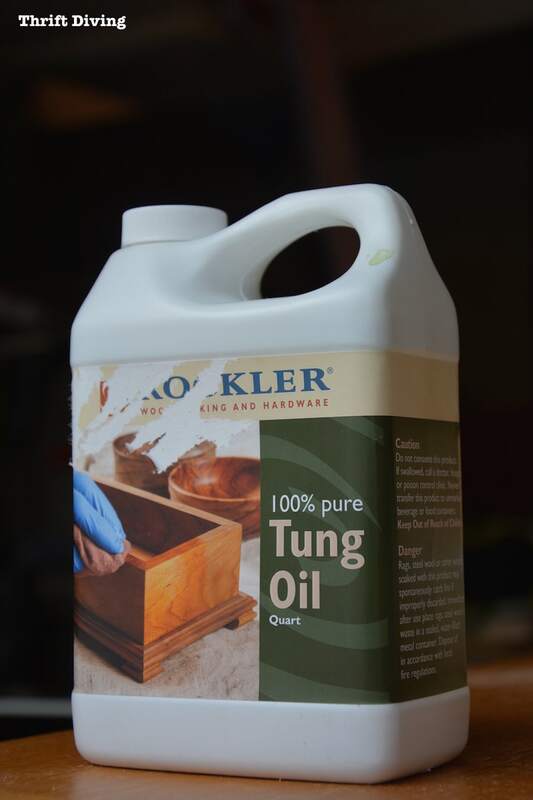 It polished the wood so beautifully it made me wonder why I hadn’t been using tung oil sooner! (Thanks to the reader that put a bug in my ear to start using this!). 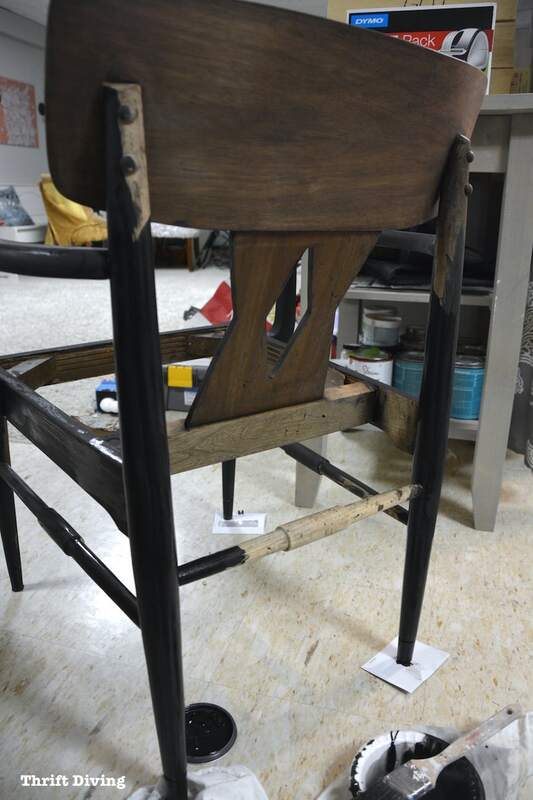 For the body of the chair, I used the steel wool on the black paint, too, and was surprised to see it begin to turn shiny, as if the steel wool was waxing the paint! Once I added some Light Antiquing wax on the body afterward, it was turning into an amazing chair that I was actually proud of! And the way that black shined again the wood tones–loved it! 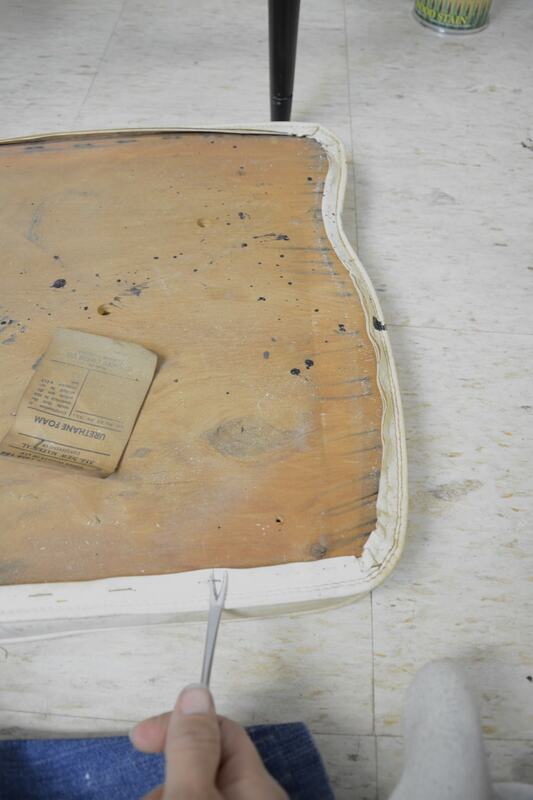 But the last thing I needed to do was cover the old seat by removing the old staples with a tack remover. I was too cheap to go and buy a new piece of wood for the seat, which I may decide to do later since this one was a bit warped. But I just worked with what I had! 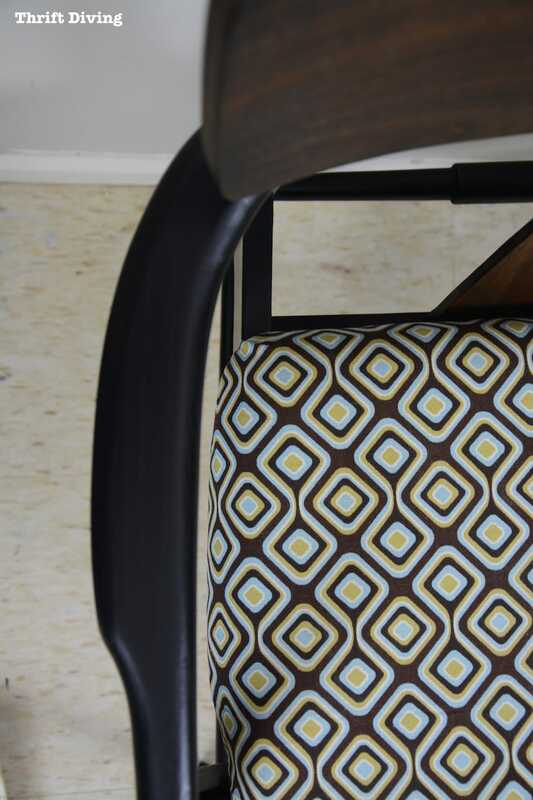 And I chose this fabric because 1) I already had it on-hand, and 2) I loved how the geometrical shape complimented the chairs diamond-shaped back. And while there are still a few issues, like the fact that I have to fix a wobbly arm, and there’s still some discoloration in parts of the wood’s diamond-shaped part, you know what?? This chair actually turned out pretty cute! Remember how the back was looking after my horrible stain-job? Well, it looks like a whole new chair now! Never give up. Yep, I just about wanted to throw in the towel on this project after the PART 1 debacle, but I kept going! It’s normal to become discouraged after a flop, but if you just step away, regroup, and think about solutions, you can usually keep moving forward. Steel wool is amazing! It was such a gentle abrasion and smoothed out parts of the wooden back that fine sandpaper would have probably scratched up. Glad I have lots of it on-hand! There are safe products for stripping! 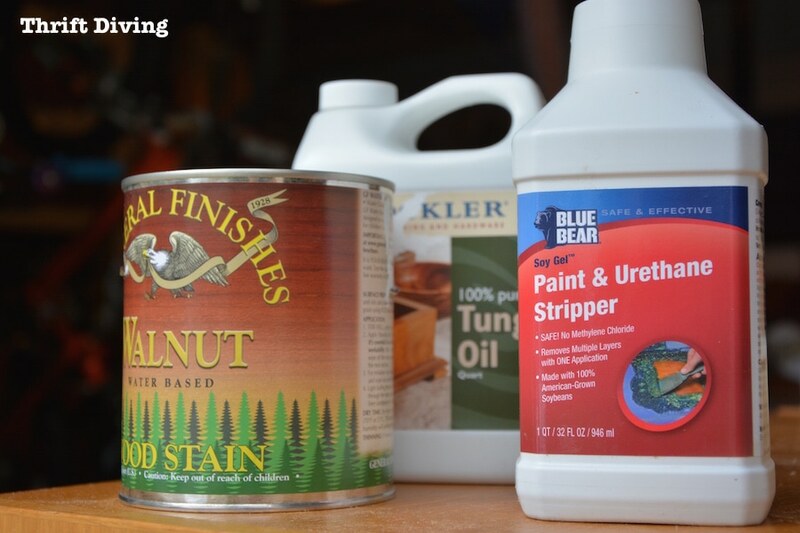 I’ve always used toxic products when stripping and staining, but I love the Blue Bear soy-based stripper, the General Finishes water-based walnut stain, and the Rockler tung oil, which are all more natural and can be used indoors because there are no harsh odors! I’ll be keeping these products stocked on my shelf from now on! Go to Rockler.com and find some safer refinishing products, too! 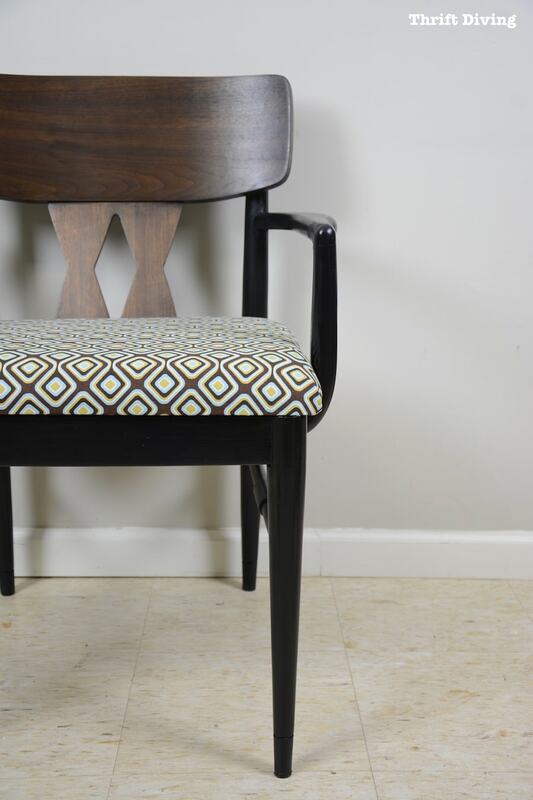 So what do you guys think of my mid-century modern chair makeover save?? 🙂 Leave a comment below and let’s talk about it! 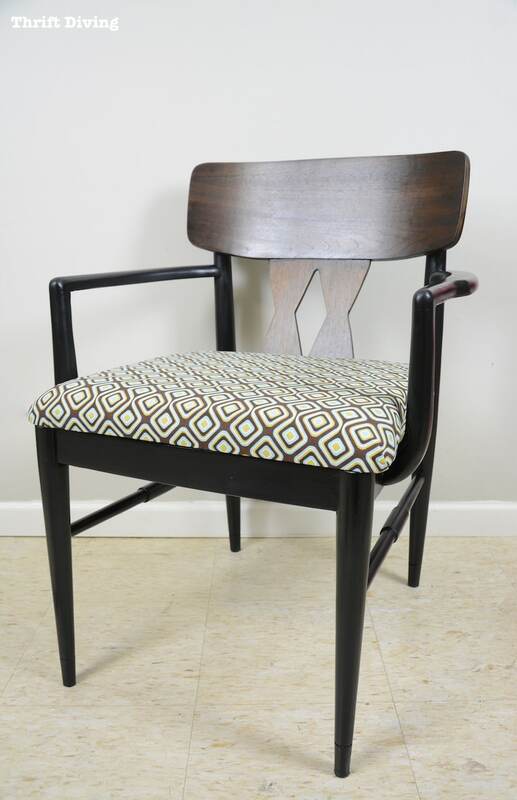 I love the way this chair turned out, yes a lot of work, but you had the perseverance to see it through. Serena you know this is now a “Serena Original” and frankly, should be in some high end shop in LA. It would sell mega bucks for someone looking to add to their contemporary designed home. Good Job…. 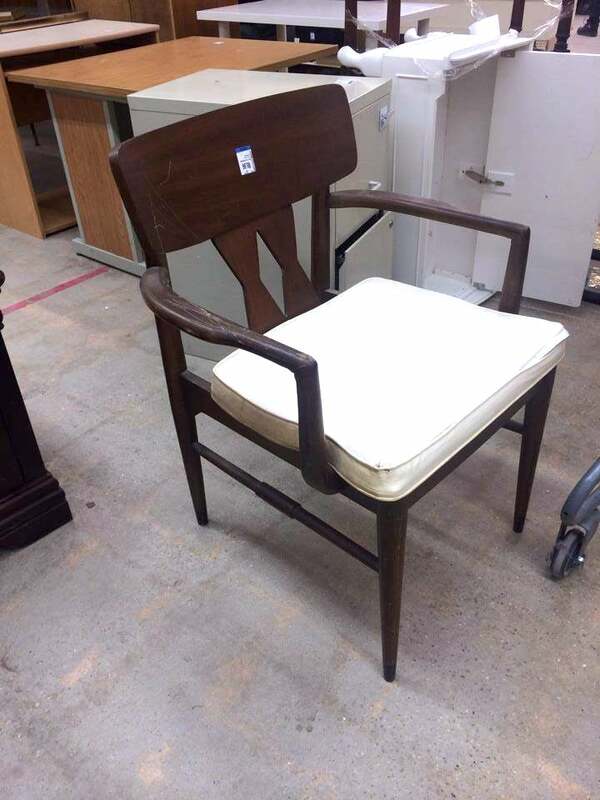 I am sooooo glad you kept on going, especially the chair. Yes, DON’T GIVE UP!! You give me big time inspirations. I look for your blogs each and every day!! thanks, jean…..